STROLL Whether to visit monuments or to wander through the beautiful streets of Marrakesh, a ride in a carriage is a must, not to forget the city stories told by the coachman. However, the carriage has built quite a bad reputation through the years, so how about we go on a ride to discover the real story. First step: Finding a carriage, which let’s be honest won’t be much of a hustle, as you can find it everywhere, some of them will even find you as they are in a constant hunt for clients. The hitches HQ is at the Place Jemaa El Fna, in front of Club Med. We will try to find our carriage, out of the 150 that travels the city streets, in front of Hôtel Marrakech. After a hard negotiation session, more about the price than the path of our little journey, here we are sitting on those comfortable rosy seats, with Najib as our coachman, so let the journey begin! Enjoying the music made by the horses’ hoofs and the carriage bells, while going through the Mohammed V avenue on our own rhythm surrounded by the speeding cars, motorcycles, and buses, unlike them, we took time to enjoy the moment peacefully. From Place Jamaa El Fna to the Koutoubia, passing by the Mamounia, and Gueliz, we end up in the calm Hivernage Avenue, where we enjoyed the little refreshing breeze in this sunny day. Although we were a little bit troubled by the pollution, that didn’t stop users from enjoying the rest of our journey, through the Mohamed V Avenue, passing by the Congress Palace and the Royal theatre all elongated by a beautiful flowery path. Our promenade has reached its ending, a one-hour journey that has cost us 150 dirhams, a little expensive, but totally worth it! 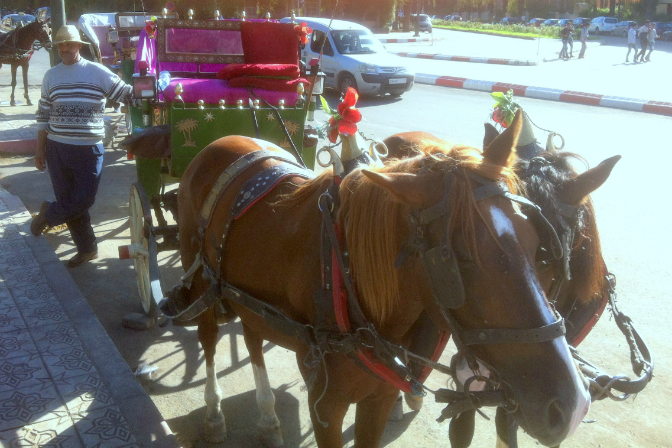 There are around 150 carriages in Marrakesh, for each its own number. And for all the animal lovers out there no need to worry, as the SPANA will conduct a check on the horses every four months and they have the ability to forbid a horse from working if its condition is bad.